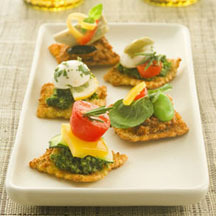 CooksRecipes has quality, kitchen-tested recipes for vegetable appetizers, canapés & hors d'oeuvres that are perfect for parties and entertaining. 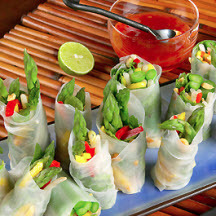 Recipe courtesy of California Asparagus Commission. 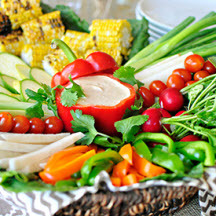 Fresh sweet peppers, grilled corn and crisp garden vegetables set a new standard for vegetable trays with ranch dip. Make the tray the center piece at your next party. Decorated with artful toppings, these ravioli bites are irresistible additions to a night of entertaining.